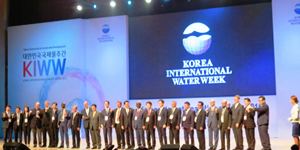 APWF secretariat attended the First Korea International Water Week, held in Daegu from October 19th to 22nd. This event was the first initiative created jointly by government, industry and academia as a follow-up activity to the 7th World Water Forum, hosted by South Korea in April, 2015. Its aim was to show concrete implementation measures for the solution of water problems. One of KIWW’s features was that South Korea, which had hosted the 7th World Water Forum, held sessions focused on the follow-up to the 7th World Water Forum, such as Implementation Roadmap and Annual Review of the 7th World Water Forum and World Water partnership, in order to continue playing a leading role in the global arena. It also made strong efforts to raise public awareness. For example, the government established various prizes for South Korean students and civic groups as well as for foreign groups in order to encourage and support them to identify the causal problems and implement the best solutions. 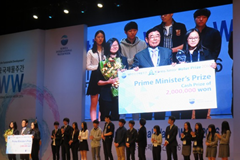 The winner of the Prime Minister’s Award was awarded a scholarship worth two million Korean Won. In parallel with KIWW, the Daegu Metropolitan government hosted the World Water Cities Forum (WWCF). Participating were the Nagoya City Waterworks and Sewerage Bureau (Japan), and representatives from Orange County (US), Taipei (Taiwan), Ho Chi Minh City (Vietnam), Plovdiv (Bulgaria), Metro Manila (Philippines), Montpellier (France), and Leeuwarden (the Netherlands). Representatives from these cities made presentations under the theme Cities and Water for Sustainable Development, in order to share their knowledge, experiences and efforts concerning solutions to water-related challenges; technological innovation for sustainable development, including processes and approaches; governance; sustainable financing mechanisms; and joint programs each city is involved in together with local academic institutes, researchers, and industry. One factor that marked the WWCF was the effort put forth by the mayor of Daegu. He endeavored to generate a synergy effect by creating partnerships between cities with the aim of developing Daegu as a city with advanced water industry through learning from the presentations of participating cities. In the panel discussion, the participants discussed the principles behind each success story. Firstly, the leaders themselves are willing to learn best practices for the solution of water problems, and have short, middle and long-term visions for creating better cities. Secondly, governments should make an effort to communicate well with local residents and promote human-resources and cultivate organizations in order to implement such visions. South Korea held its first KIWW this year, and announced that it will host the second KIWW, and the first Asia International Water Week (AIWW) from September 20 to 23, 2017 in Gyeongju in Gyeongsangbuk. The nation has taken positive actions since the 7th World Water Forum. While there are many similar international conferences across the world, South Korea seek to its own initiatives in the global arena by acquiring knowhow from various organizations. We would like to analyze the roles of South Korean-led initiatives such as KIWW and AIWW in the international community, and in Asia in particular.